To Cite: Nabilpour M, Mayhew J . Effect of Peripheral Heart Action on Body Composition and Blood Pressure in Women with High Blood Pressure, Int J Sport Stud Hlth. 2018 ; 1(2):e81874. doi: 10.5812/intjssh.81874. Objectives: Exercise is non-medical treatment and low-risk strategy for people with hypertension. Therefore, the aim of this study was to evaluate the effect of peripheral heart action (PHA) on body composition and blood pressure in women with high blood pressure. Methods: Twenty women (age = 38 - 46 years, BMI = 21 - 31 kg/m2) who had high blood pressure (135/88 mm Hg) volunteered to participate. Ten were randomly selected and submitted to 32 PHA exercise sessions. The remaining 10 participants served as a non-exercise control group. Systolic (SBP) and diastolic blood pressure (DBP), skinfold, and 1RM tests of maximum strength were determined before and after 36 exercise sessions. 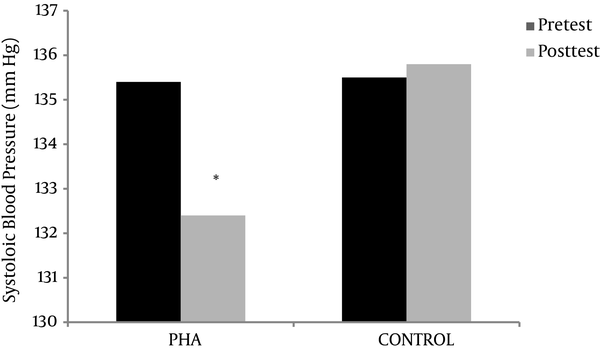 Results: SBP and DBP were decreased significantly (P < 0.05) in the PHA group but not in the non-exercise control group. Furthermore, the training group made significant improvements in test of one-repetition maximum and body composition compared to the control group (P < 0.05). Conclusions: Resistance exercises using the PHA approach can be considered as a low-risk treatment for people with high blood pressure in order to improve blood pressure, increase muscular strength, and enhance overall fitness. Hypertension is a chronic cardiovascular disorder characterized by an increase in pulmonary vascular resistance which can lead to right ventricular failure (1). The prevalence of pulmonary hypertension is 10 - 15 per million, with a mortality rate of 15% per year (2). Over the past two decades, targeted therapies have been effective in reducing disease progression and improving survival among patients with pulmonary hypertension (3). However, improvements in targeted blood pressure treatments have their limits, and additional therapeutic strategies are needed to reduce mortality. In addition to pulmonary compilations, muscular disorders such as sarcopenia, fiber type change, and muscle contractions disorders are ancillary disabilities accompanying hypertension. Although previous research has shown that exercise may help improve dyspnea, reduce fatigue, and lower blood pressure (4), concerns have been expressed over the use of resistance exercises as part of a comprehensive exercise program to reduce cardiovascular disease risk in the elderly people (5) and in high-pressure populations (6, 7). These concerns focus on limiting the degree of this form of training since it may aggravate the progression of the disease and increase the risk of sudden death from a heart attack (7). However, from 2009 onwards, guidelines have been revised and include exercise as a suitable, stable, safe, and non-pharmacotherapy for patients with hypertension and chronic lung disease (8, 9). Recent investigations, however, have shown that resistance exercise can be incorporated in training programs of hypertensive individuals with significant results showing decrements (10, 11), increments (12), or no change (13, 14) in blood pressure levels. Accordingly, it would be advantageous to find a training method that can both support muscle hypertrophy and treat hypertension at the same time. Such a program might increase muscular strength and power and promote greater physical activity in hypertensive patients. Researchers have examined the effect of variables such as volume, intensity, and exercise methods on blood pressure responses after a session of resistance activity and have reported positive results (15, 16). Resistance exercises with low intensity and short periods of rest between sets have been shown to reduce artery stiffness and improve vascular function by increasing arterial diameter of the rest (17). In addition, the intensity of resistance exercise has been shown to create a plasma shift from blood to the interstitial space to the same degree as seen in dynamic exercises such as biking (18). Rezk et al. (19), reported that resistance training causes a reduction in blood pressure in healthy people after exercise at both low and high intensities, which was similar to that seen in aerobic exercises. Factors such as the hemodynamic and metabolic responses relative to the amount of active muscle mass and regions in the arms and legs may affect the response of blood pressure after exercise (20). A training protocols designed by Steinhaus in 1940 specifically alternated exercise emphasis between upper and lower body without a break between the two conditions. 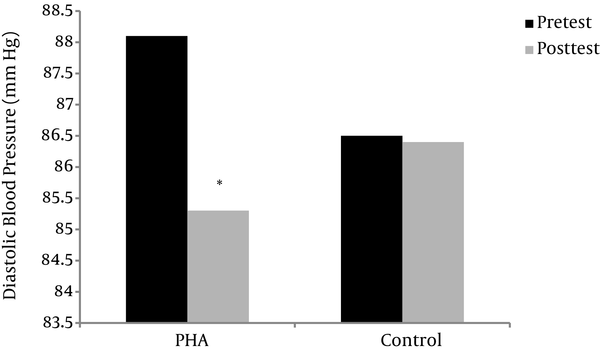 The positive effects of limiting rest between upper- and lower-body exercises, termed peripheral heart action (PHA), were elucidated by Asmussen and Mazin (21). Their findings showed that active rest between stations had significant effects compared to passive rest. Piras et al. (2015) recently found that PHA training produced increases in muscle strength and vasovagal tone in a group of young men and women. These studies noted that this form of exercise can simultaneously increase strength, promote hypertrophy, and improve body composition, which can lead to a reduction in high blood pressure. Women in the middle-age years may be particularly susceptible to high blood pressure as well as accompanying disorders of Osteoporosis and Sarcopenia which can lead to further deterioration in activities of daily living. Having considered the issue, studying the effect of PHA on older women with hypertension can be effective. Thus, the purpose of this study was to investigate the effect PHA training on middle-aged hypertensive women. Twenty women with hypertension who had a history of blood pressure medications and were referred to the Turgan health center volunteered to participate in the research. Demographic charactristics are presented in Table 1. None of the participants had a history of regular resistance exercises for two years before the start of the study. Before testing, information was given about the training program and possible risks and discomforts associated with it. Each participant completed a written consent form. The study was approved by ethical committee of Imam Khomeini international university (License No. 17628) and complied with the declaration of Helsinki. Ten participants were randomly selected as a training group, with the remaining 10 serving as a control group. The control group was present in the facility health center but did not practice any special kind of exercise; and anthropometric tests were performed. All participants received some dietary advice and proper timing of food consumption. Medical records and blood pressure of participants were evaluated by a sports physician. Systolic and diastolic blood pressure values and heart rate were measured after a 5-minute rest in a seated position in a chair. Systolic and diastolic pressures were determined three times per session during two separate sessions. In all sessions, blood pressure was measured using a standard sphygmomanometer and telephone gauge (ALPK2, Hangzhou Rollmed, Japan), by the first and fifth Korotkoff sounds as systolic and diastolic blood pressure, respectively. Skinfolds were measured with a slim guide caliper by an internationally certified technician using the criteria of international society for the advancement of kinanthropometry. Percent body fat (PBF) was estimated using a gender-specific prediction equation (22). All participants participated in four separate days of familiarization for maximum muscle strength estimation (23). One-repetition maximum (1RM) was determined for shoulder press, bench press, leg extension, and seated leg curl. Also, each session of resistance training started with 12 minutes of warm up and finished with 5 minutes of cool-down. The arrangement of the stations was as follows: front of the arm stand, squat in the seat, back of the wristband, front of the car, and head of the barbell; after completing these five movements, the participants were given active rest for 2 to 3 minutes. PHA training consisted of alternating between upper-body and lower-body exercises with no rests between exercises. In this study, the resistance training protocol consisted of push-ups, seated leg curl, back extension, seated calf raise, and seated cable row. Following a 2 - 3-minute rest, participants performed cable front raise, box stepping, EZ-bar preacher curl, and leg abductor machine. Following another 2 - 3-minute rest, participants completed incline bench press, walking lunge, latissimus pulldown, decline reverse crunch, and dumbbell lateral raise. Each station had 15 repetitions. The practice load at each station was determined to be between 55% and 60% of a maximum repetition using the Brzycki formula for estimating %1RM (24). In order to comply with the principle of overload, the workload was increased by 2 - 5% in each exercise every two weeks. Thirty-two training sessions were completed over a 10-week period. The normal distribution of data (average and standard deviation) was assessed by the Shapiro-Wilk’s test. Comparisons between pre-test and post-test was performed using paired t-tests, while between-group comparisons were performed using independent t-test. Statistical analyses were performed with SPSS version 22 (IBM, Chicago, IL) at a significance level of 0.05. Resting heart rate, systolic and diastolic blood pressure values decreased significantly by 5.2%, 2.2%, and 3.2%, respectively, after 32 sessions of exercise in the PHA group compared to < 1% change in the control group (Table 1). In addition, 1RM strength performance in bench press, shoulder press, leg extension, and leg curl increased by 16.5%, 16.0%, 12.8%, and 17.1%, respectively, in the PHA group compared to decreases of 1.0 - 2.9% in the control group (Table 1). As it can be seen in figure 1 and 2, both Systolic and Diastolic blood pressure were significantly decreased in PHA group compared to control group (p ≤ 0.05). Independent T-test also indicated that body mass index (t = 2.20; P = 0.041), body fat percentage (t = 2.34; P = 0.034), systolic blood pressure (t = 2.25; P = 0.038) and strength in upper extremity (t = 2.14; P = 0.045) were significantly different in PHA group than control group. The aim of the present study was to evaluate the effect of PHA training on blood pressure, muscular strength, and body composition responses of hypertensive middle-aged women. The results showed this type of resistance exercise can have a significant effect on systolic and diastolic blood pressure as well as resting heart rate while performing with moderate loads. Recent studies have shown that resistance exercise can reduce blood pressure (1-3). However, few studies have explored the effect of PHA resistance exercise in hypertensive women. Rodriguez et al. (25) were unable to reduce post-exercise systolic and diastolic blood pressure when using traditional and tri-set resistance training methods. The traditional group rested one minute between sets of each exercise, while the tri-set group performed a sequence of different upper-body exercises without rest between sets. Blood pressures were measured periodically over a 90-minute period following exercise. It is difficult to compare their results with the current study since their participants were young males (19.7 ± 0.7 yrs) with normal resting blood pressures (115 - 125/72 - 77 mmHg). Piras et al. (2015) stated that PHA exercises have produced adaptations commensurate with high-intensity interval training exercises because the physiological stress can be applied for longer periods. Moderate load, high volume resistance training has been shown to reduce systolic blood pressure through increased parasympathetic activity (26, 27). Other possible mechanisms influencing hypotension after activity include decreased sympathetic neuropathy, increased cardiac outflow, and reduced peripheral vascular resistance (28). A significant decrease in resting heart rate was shown in the PHA group. The percent change was similar to that noted in aerobic training (29). Cornelissen et al. (2010) found that higher intensity aerobic exercise produced a greater effect on cardiovascular function. Their participants performed running, cycling, and stepping at low- and high-intensity (33% and 66% of heart rate reserve, respectively) and showed comparable reductions in resting heart rate between the two groups (7.2% and 7.8%, respectively). Resting heart rate reduction by the PHA group in the current study was comparable (i.e., 5.2%), suggesting that PHA exercise can produce similar enhancement in heart function to traditional aerobic exercise. The current results suggest that PHA is a form of exercise that can significantly increase muscular strength in middle-aged women. Bench Press (14.1%), shoulder press (13.8%), leg extension (11.3%), and seated leg curl (14.6%) showed comparable increases in 1RM performance to previous studies that used higher intensity resistance exercise protocols (30). In order to maintain continuous activity in PHA, the loads of the exercises are typically lower than those in traditional resistance training (31). The lighter loads utilized in the current study may be an advantage to avoid soreness and injury as well as promote routine participation. The PHA exercise program created in this study resulted in a significant 3.3% reduction in PBF which can be one of the possible mechanisms for lowering blood pressure (32). However, studies in all weight loss patients did not show a decrease in blood pressure, and patients with definite lowering of blood pressure did not lose weight (25). However, it is likely that muscle hypertrophy has occurred at the same time as fat loss, and overall weight loss has not been achieved. In the present study, By decreasing BMI, muscle strength was improved. That is probably an indication of muscle hypertrophy and neuromuscular adaptations. With an increase in each unit of BMI, 8% increase in the probability of a heart attack can be found, and on the contrary, by increasing physical activity by one metric, the risk of cardiovascular disease decreases by 8% (30). Resistance exercises using the PHA approach can be considered as a low-risk treatment for people with high blood pressure in order to improve blood pressure, increase muscular strength, and enhance overall fitness. 1. Pandey A, Garg S, Khunger M, Garg S, Kumbhani DJ, Chin KM, et al. Efficacy and Safety of Exercise Training in Chronic Pulmonary Hypertension: Systematic Review and Meta-Analysis. Circ Heart Fail. 2015;8(6):1032-43. doi: 10.1161/CIRCHEARTFAILURE.115.002130. [PubMed: 26185169]. 2. Mereles D, Ehlken N, Kreuscher S, Ghofrani S, Hoeper MM, Halank M, et al. Exercise and respiratory training improve exercise capacity and quality of life in patients with severe chronic pulmonary hypertension. Circulation. 2006;114(14):1482-9. doi: 10.1161/CIRCULATIONAHA.106.618397. [PubMed: 16982941]. 3. Fox BD, Kassirer M, Weiss I, Raviv Y, Peled N, Shitrit D, et al. Ambulatory rehabilitation improves exercise capacity in patients with pulmonary hypertension. J Card Fail. 2011;17(3):196-200. doi: 10.1016/j.cardfail.2010.10.004. [PubMed: 21362526]. 4. Batt J, Ahmed SS, Correa J, Bain A, Granton J. Skeletal muscle dysfunction in idiopathic pulmonary arterial hypertension. Am J Respir Cell Mol Biol. 2014;50(1):74-86. doi: 10.1165/rcmb.2012-0506OC. [PubMed: 23972212]. 5. Medicine ACS. ACSM's Health-Related Physical Fitness Assessment Manual. Illustrated ed. Lippincott Williams and Wilkins; 2013. 192 p.
6. Schultz MG, Otahal P, Cleland VJ, Blizzard L, Marwick TH, Sharman JE. Exercise-induced hypertension, cardiovascular events, and mortality in patients undergoing exercise stress testing: a systematic review and meta-analysis. Am J Hypertens. 2013;26(3):357-66. doi: 10.1093/ajh/hps053. [PubMed: 23382486]. 7. Tabet JY, Meurin P, Driss AB, Weber H, Renaud N, Grosdemouge A, et al. Benefits of exercise training in chronic heart failure. Arch Cardiovasc Dis. 2009;102(10):721-30. doi: 10.1016/j.acvd.2009.05.011. [PubMed: 19913773]. 8. Nogueira-Ferreira R, Moreira-Goncalves D, Santos M, Trindade F, Ferreira R, Henriques-Coelho T. Mechanisms underlying the impact of exercise training in pulmonary arterial hypertension. Respir Med. 2018;134:70-8. doi: 10.1016/j.rmed.2017.11.022. [PubMed: 29413511]. 9. Galie N, Hoeper MM, Humbert M, Torbicki A, Vachiery JL, Barbera JA, et al. Guidelines for the diagnosis and treatment of pulmonary hypertension: the Task Force for the Diagnosis and Treatment of Pulmonary Hypertension of the European Society of Cardiology (ESC) and the European Respiratory Society (ERS), endorsed by the International Society of Heart and Lung Transplantation (ISHLT). Eur Heart J. 2009;30(20):2493-537. doi: 10.1093/eurheartj/ehp297. [PubMed: 19713419]. 10. Keese F, Farinatti P, Pescatello L, Monteiro W. A comparison of the immediate effects of resistance, aerobic, and concurrent exercise on postexercise hypotension. J Strength Cond Res. 2011;25(5):1429-36. doi: 10.1519/JSC.0b013e3181d6d968. [PubMed: 21358433]. 11. Simao R, Fleck SJ, Polito M, Monteiro W, Farinatti P. Effects of resistance training intensity, volume, and session format on the postexercise hypotensive response. J Strength Cond Res. 2005;19(4):853-8. doi: 10.1519/R-16494.1. [PubMed: 16287352]. 12. O'Connor PJ, Bryant CX, Veltri JP, Gebhardt SM. State anxiety and ambulatory blood pressure following resistance exercise in females. Med Sci Sport Exerc. 1993;11(4):516-21. doi: 10.1249/00005768-199304000-00015. 13. Marchiando RJ, Elston MP. Automated ambulatory blood pressure monitoring: clinical utility in the family practice setting. Am Fam Physician. 2003;67(11):2343-50. [PubMed: 12800963]. 14. Roltsch MH, Mendez T, Wilund KR, Hagberg JM. Acute resistive exercise does not affect ambulatory blood pressure in young men and women. Med Sci Sports Exerc. 2001;33(6):881-6. [PubMed: 11404651]. 15. Kelley GA, Kelley KS. Progressive resistance exercise and resting blood pressure : A meta-analysis of randomized controlled trials. Hypertension. 2000;35(3):838-43. [PubMed: 10720604]. 16. Cornelissen VA, Fagard RH, Coeckelberghs E, Vanhees L. Impact of resistance training on blood pressure and other cardiovascular risk factors: a meta-analysis of randomized, controlled trials. Hypertension. 2011;58(5):950-8. doi: 10.1161/HYPERTENSIONAHA.111.177071. [PubMed: 21896934]. 17. Okamoto T, Masuhara M, Ikuta K. Effect of low-intensity resistance training on arterial function. Eur J Appl Physiol. 2011;111(5):743-8. doi: 10.1007/s00421-010-1702-5. [PubMed: 20972878]. 18. Collins MA, Cureton KJ, Hill DW, Ray CA. Relation of plasma volume change to intensity of weight lifting. Med Sci Sports Exerc. 1989;21(2):178-85. [PubMed: 2709980]. 19. Rezk CC, Marrache RC, Tinucci T, Mion DJ, Forjaz CL. Post-resistance exercise hypotension, hemodynamics, and heart rate variability: influence of exercise intensity. Eur J Appl Physiol. 2006;98(1):105-12. doi: 10.1007/s00421-006-0257-y. [PubMed: 16896732]. 20. De Almeida WS, De Jesus Lima LC, Da Cunha RR, Simões HG, Nakamura FY, Campbell CSG. Post-exercise blood pressure responses to cycle and arm-cranking. Sci Sport. 2010;25(2):74-80. doi: 10.1016/j.scispo.2009.09.001. 21. Asmussen E, Mazin B. Recuperation after muscular fatigue by "diverting activities". Eur J Appl Physiol Occup Physiol. 1978;38(1):1-7. [PubMed: 631115]. 22. Jackson AS, Pollock ML, Ward A. Generalized equations for predicting body density of women. Med Sci Sports Exerc. 1980;12(3):175-81. [PubMed: 7402053]. 23. Amarante do Nascimento M, Januario RS, Gerage AM, Mayhew JL, Cheche Pina FL, Cyrino ES. Familiarization and reliability of one repetition maximum strength testing in older women. J Strength Cond Res. 2013;27(6):1636-42. doi: 10.1519/JSC.0b013e3182717318. [PubMed: 22990569]. 24. Brzycki M. Strength Testing—Predicting a One-Rep Max from Reps-to-Fatigue. J Phys Edu Recreat Dance. 1993;64(1):88-90. doi: 10.1080/07303084.1993.10606684. 25. Rodriguez D, Polito MD, Bacurau RFP, Prestes J, Pontes Jr FL. Effect of Different Resistance Exercise Methods on Post-Exercise Blood Pressure. Int J Exercise Sci. 2008;1(4). 26. Eches EHP, Ribeiro AS, Gerage AM, Tomeleri CM, Souza MF, Nascimento MA, et al. Twenty minutes of post-exercise hypotension are enough to predict chronic blood pressure reduction induced by resistance training in older women. Motriz: Revista de Educação Física. 2018;24(1). 27. Tomeleri CM, Marcori AJ, Ribeiro AS, Gerage AM, Padilha CS, Schiavoni D, et al. Chronic Blood Pressure Reductions and Increments in Plasma Nitric Oxide Bioavailability. Int J Sports Med. 2017;38(4):290-9. doi: 10.1055/s-0042-121896. [PubMed: 28219107]. 28. Cornelissen VA, Smart NA. Exercise training for blood pressure: a systematic review and meta-analysis. J Am Heart Assoc. 2013;2(1). e004473. doi: 10.1161/JAHA.112.004473. [PubMed: 23525435]. [PubMed Central: PMC3603230]. 29. Cornelissen VA, Fagard RH. Effect of resistance training on resting blood pressure: a meta-analysis of randomized controlled trials. LWW. 2005. 30. Kraemer WJ, Ratamess NA, French DN. Resistance training for health and performance. Curr Sports Med Rep. 2002;1(3):165-71. [PubMed: 12831709]. 31. Sillanpaa E, Laaksonen DE, Hakkinen A, Karavirta L, Jensen B, Kraemer WJ, et al. Body composition, fitness, and metabolic health during strength and endurance training and their combination in middle-aged and older women. Eur J Appl Physiol. 2009;106(2):285-96. doi: 10.1007/s00421-009-1013-x. [PubMed: 19266214]. 32. Mertens IL, Van Gaal LF. Overweight, obesity, and blood pressure: the effects of modest weight reduction. Obes Res. 2000;8(3):270-8. doi: 10.1038/oby.2000.32. [PubMed: 10832771].